After spending a day and a half anchored in the safe harbor of Moreton Bay, we were finally cleared to resume our journey around noon today. Cyclone Oswald has moved south of us. Since we lost a day and 2 nights, we are going to have to miss 2 ports - Whitsunday Island and Cairns. We will now have 3 days at sea in order to get to Cooktown. Once there we will be back on schedule. I think a lot of people are going to be disappointed since this means they will not be able to see the Great Barrier reef up close on tour. The bird that took refuge on our balcony last night was still there until about 11AM this morning. That was when the sky started to brighten up a bit and we started seeing birds flying above the waves again. We were very glad to be anchored last night for our anniversary dinner. 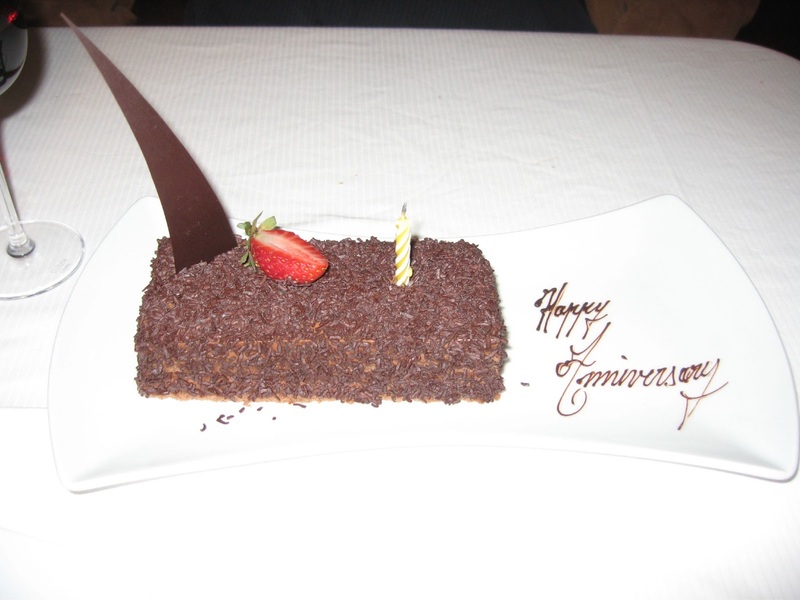 We had a good dinner at the steak house last night, ending with the waiters bringing a scrumptious chocolate cake for dessert. 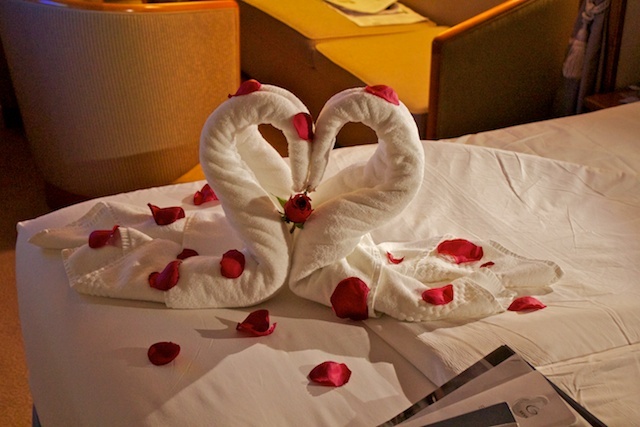 When we returned to our room, we found the housekeeping staff had created towel swans on the bed, with rose petals around them. It was lovely. We were very glad to have a steady ship last night and this morning, but that has changed significantly since we left anchorage. The captain warned us that it would be rough until after 11PM tonight and he wasn't kidding. Normally Ray is more affected by a ship rocking and rolling than I, but not this time. We are getting both pitch and roll this afternoon, and I am feeling it too. We are keeping pretty much to our room and it seems most everyone else is doing the same. Ray had to deliver some papers to guest services this afternoon and he said the halls were empty. We are planning to skip the dining rooms tonight and just order in something light.